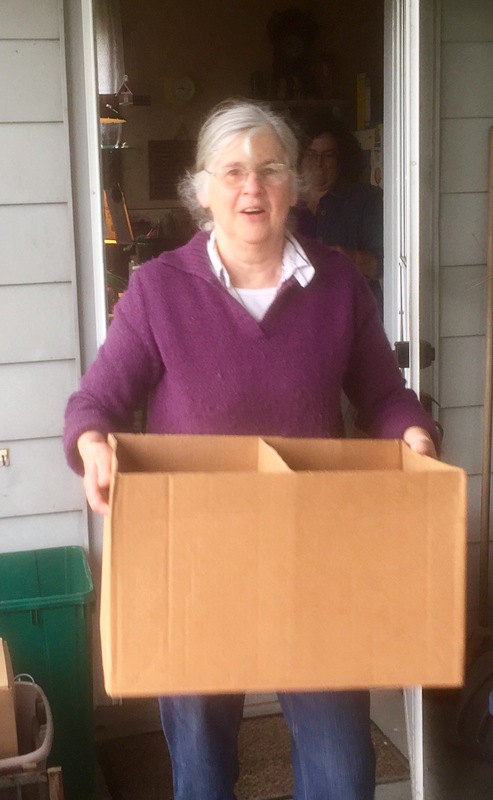 For nearly four months now, we have been clearing out the house our Aunt Ruthie shared with Grandma Longenecker. My sisters and brother have been doing the bulk of the work so far. But in April help came from some members of Bossler Mennonite Church. Their assistance has kept us from going straight to Berserk-istan! They anticipated our needs without our voicing them. She brought us several meals including soup, sausage, potatoes and cookies and helped bring items down from the attic. They didn’t go by feelings or energy level. Pastor Fred uses oxygen as needed, an appliance concealed here in a backpack. His mighty willingness to serve superseded health challenges. They didn’t let age limit their serving. 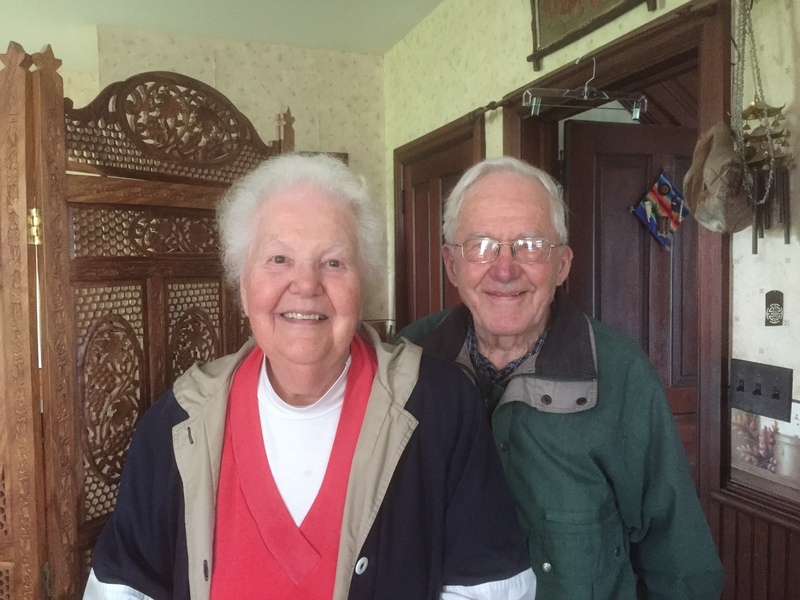 Dorothy and Homer Hess, both in their eighties, brought a vegetable ham soup lunch. They want to return to place Hummel plates into boxes that match. 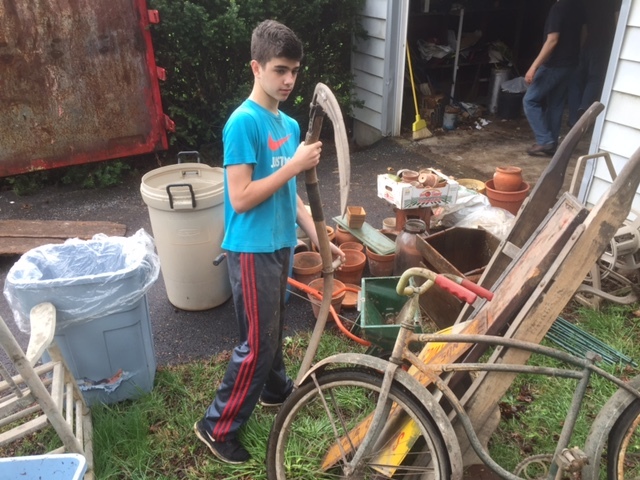 Seventh grader Zach Nell got into the action too, scrutinizing a scythe. We appreciated guy muscle help. Melanie Nell and Ehren Fairfield decide what to do next. 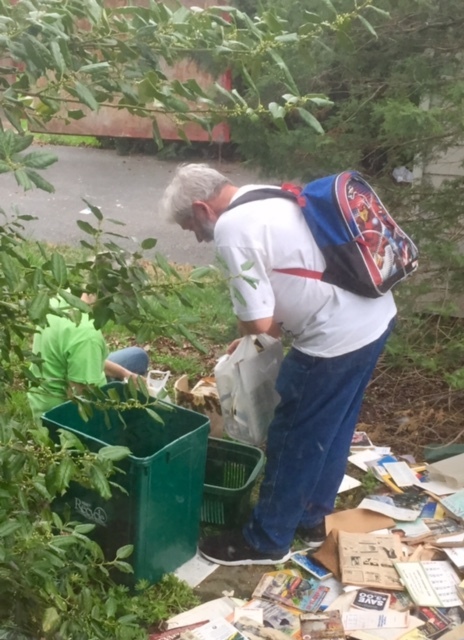 A church trustee, Elvin Hostetter, returned later to move some final hefty items. Some like Grandma Longenecker in last week’s post use words to proclaim their faith. Others like these folks offer fleet feet, a witness both audible and visible. 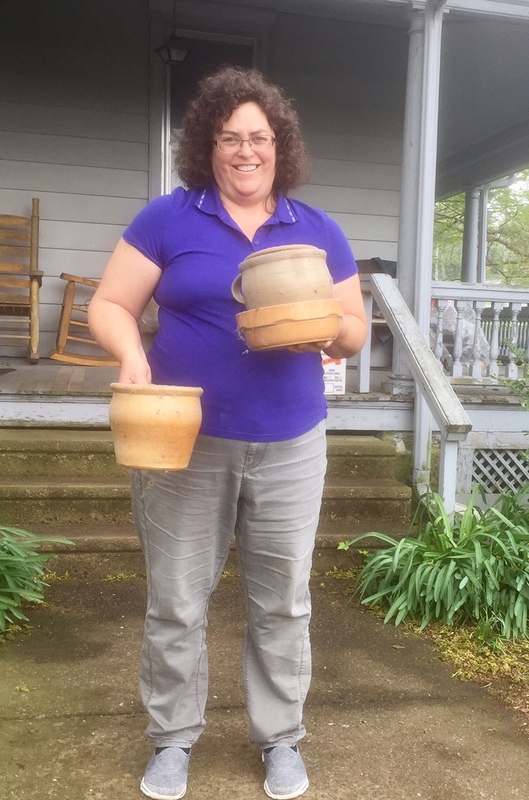 Traditions other than the Mennonites take care of their own and also reach out to others. I am grateful that I was reared in such a culture and continue to be sustained by it. Have you ever received assistance from an unexpected source? Have you wished for help on a daunting project? Is it hard for you to receive help from others? Fleet feet accompanied with the beat of love. Loved reading this Marian – truly, people do love to help. The angels are here on earth. How more neighbourly can these blessed people be and doing it with their might? Yes I’ve received help from unexpected sources on the odd occasion and this makes me remember to pay it forward wherever and whenever I can. Sometimes I think that it is easier to give than to receive, but that is an existential question …one day I’ll write about it. Thank you for this lively (typo, but I’m leaving it in) and lovely post, reminding me of the goodness of people. I am eager to know your thoughts about giving and receiving as an existential question. Political upheavals and other frightening news can’t squash out good impulses. Thanks for pointing that out as the conversation gets started here, Susan. Good morning, Marian! How wonderful that all of these people chose to help you–and so graciously and cheerfully. You have quite a task with that house and the beautiful property. It’s wonderful that you have your family, but also “guy muscle help” and people who bring you food. 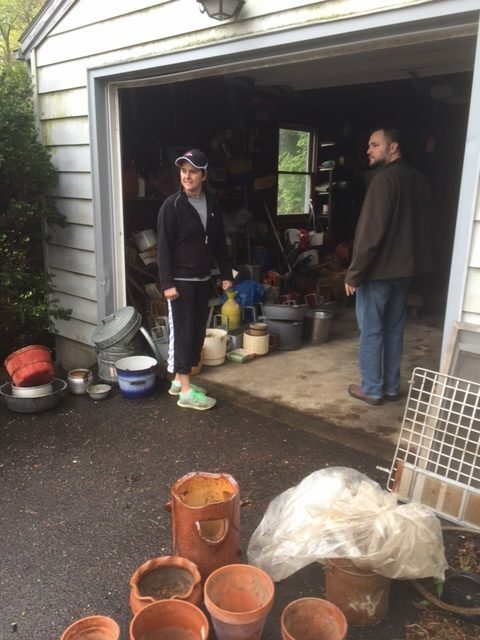 It was daunting enough for us to clean out my dad’s one-bedroom apartment years ago. We actually asked for food since many women volunteered help but didn’t have the muscle mass to accomplish the big stuff. My grandfather was a car dealer and then a farm implement supplier like my dad. Items from these businesses were stored on the property. One of the heaviest pieces was an anvil, probably 300 pounds, moved from the barn to the garage. The upside of the process is the treasures/keepsakes we find, especially handwritten documents, but I assure you I never want to tackle a job like this again. And in the midst of all this, you can keep your blog going! Thanks for reminding me of that Ecc. verse about whatsoever your hand findeth to do. Different groups select different passages from their holy book to be guiding lights. Bossler Mennonites are clearly well versed in this quote and live it faithfully. Hope you don’t have too many more trips to PA just for this purpose. And I guess the advice to the rest of us is to pare down our things before we have to have whole crews of other people do it for us? I wonder if ancestors like mine thought they were doing the next generation(s) a favor by “bequeathing” their possessions and property. Conservative folks, they also felt the impulse to also be preserve-a-tive. Are we paying penance for moving to Florida and not keeping the homestead? You must surely have written about our generation breaking such rules, Shirley! We plan to sell Ruthie’s property the end of June. As we progress, the physical and emotional efforts are bittersweet. Tolstoy’s story How Much Land Does a Man Need comes to mind just now. Thank you for all this and for your tweet share. Her Mennonite community continued to be a blessing to her, even after death. ~ I’ve helped sort through several close relatives’ belongings after they passed. It can be a poignant, interesting and sometimes hilarious venture! What makes people save the things they do? 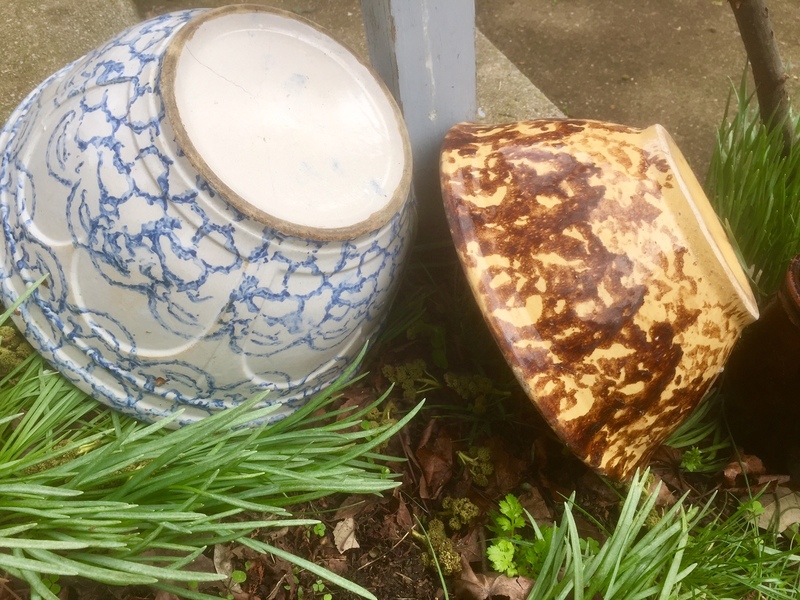 Unfortunately, the stories of these items is often lost. Lynn, my impetus for blogging as we slog through “stuff” is to record the stories. But you are right, artifacts like the trivets you collect, tell tales. Thank you, Lynn. I love all that community spirit and willingness to help. you are so blessed, Marian! I am very happy for you. Every summer, at the end of the school year, we have to empty our classrooms to make room for the summer school and all the teachers help one another with this task: it does bring people together and consolidates friendships. It certainly does take a village, doesn’t it? How wonderful you had so much support, Marian. I do have difficulty accepting help from others, but I’m working on that. Shirley’s advice is spot on! Thanks for appearing here often, Jill. Most of these people I do know. In fact, the pastor was my student at LMS in Lancaster years ago. About the peanut-butter type jars, we were told to save jars, especially hand-painted peanut butter jars. We haven’t found any. Most of the canning jars we have donated to neighbors and the thrift store. We are NOT doing this to our kids, you and I. No we aren’t! By the way, thanks too for the tweet! We cleared out Mother’s house in 2014 before we ourselves moved last year. We estimate each of us got rid of 1/3 of our STUFF. Like yours, my philosophy has changed dramatically because of that experience and I aim to acquire very few “things” from now on and I try to recycle all mail, especially magazines. I wonder if you are the Lora Lewis I knew fondly at the college. Either way, welcome! And thanks so much for your comment here. How wonderful to get much needed help. I always appreciate any help I get and am not afraid to ask for it if I really do need it. I like your comment on it being a museum, a store, and a home! I am sure you had to curate your possessions as you moved from Canada to Spain. Thanks for posting your wisdom here each week, Darlene. Many hands make light work….and hearts! So glad to hear you have support – it’s a big job, and an emotional job! Blessings on you Marian! That’s the perfect summary, Jenn; you hit the nail on the head. And there are lots of nails on the property (and hammers too)! Marian — What loving hearts and hands you had to eagerly jump into the fray to help! The type of help that I usually need—and am not afraid to ask for— is the technological kind. There are pieces that I just can’t wrap my mind around. 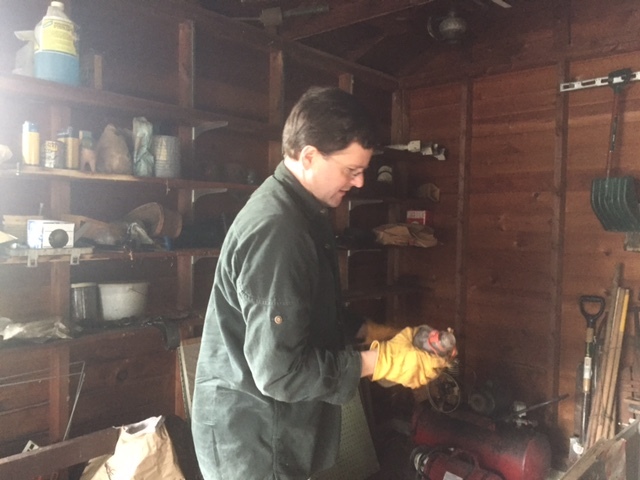 As we speak, I am trying to sort out why my MailerLite campaign didn’t launch this morning as I instructed. 😀 It smiled at me when I pushed the “send” button. Fortunately, my web guy gives help willingly and has oceans of patience. I’m not afraid to ask for help either. Thanks for you support here. Right now I’m pretty much on the receiving end, a grace I need to practice. Marian — By my definition of grace (the immediate presence of spirit) you need no practice. You are that, and then some. What wonderful helpers you have. Wouldn’t it be wonderful if all the world around us operated in this way? There is lots to learn here. As you can tell, my world view has been shaped by the example of people like these and their forebears. Although I need to know what is happening in our world, I measure my intake in tablespoons, not buckets. Mennonites don’t have a corner on this, however. Remember Robert Fulghum’s book, All I Ever Need to Know I Learned in Kindergarten. Sharing/Helping is high on the list. You speak of roots…deep roots. I’m really glad you have help breaking up the roots. It reminds me of my one year volunteering in Mennonite Disaster Service. Part of me wishes you were going to keep your roots in PA. That’s because part of me wishes I were still planted in my Mennonite childhood homeland. You do understand our ambivalence, Dolores. None of my sister’s children or mine are capable of maintaining Ruthie’s property or doing the updates that would bring it up to code. I noticed on Facebook your reference to roots via The Geography of Trees, a metaphor that fits our situation to a tee! May you continue to find blessings in the midst of the ambivalence. You are a spiritual touchstone, Dolores, always able to read between the lines. My life now does not allow for much reflection that we both enjoyed in Ben Vogt’s memoir writing class. Thanks for the follow-up comment here. When conversation becomes a chain of twists and turns, I learn so much and I hope readers here do the same. Wonderful. I’m glad you’re surrounded by loving action. For this kind of practical help, I count on my sons and a community of friends. 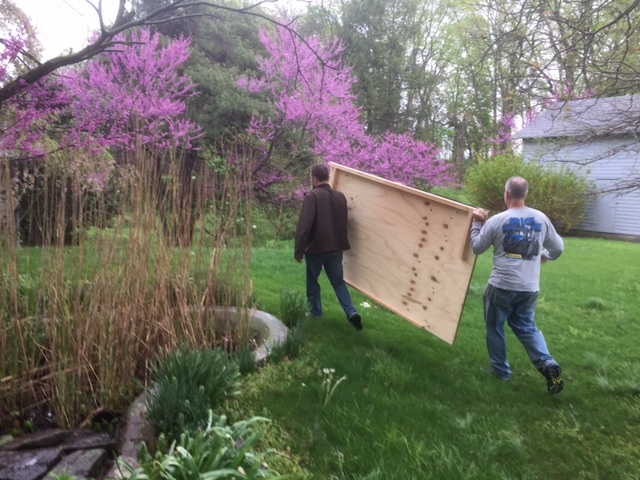 In your photos, the people shine as they help take care of the stuff, but the redbuds in the background grabbed my eye. They’re one of my favorites. I hope, hope, hope you’re almost done. The glory of spring surrounded all the busy bees. When I return, lilies of the valley should be in bloom. I’ll plunge my nose into a bouquet and inhale nostalgia. Next week I return for a final push – and then we should be able to pronounce our part “DONE”! Our biggest challenge has been lack of manpower within the family because of distance and other obligations: Cliff has been immeshed in a project and another sister’s husband has a regular job. That’s why we SO appreciated Bossler help on the scene last week and continuing. What adorable friends you have . I’m sure their help was invaluable bless their hearts . Many times have we been in debt to our neighbours here in West .Wales I can’t begin to tell you how they took us into the fold, when we first arrived , and are still doing it . Once Colin and myself went camping ,we were complete novices at the time and it was a borrowed tent . The weather was unforgiving , the winds were so high and we on top of a hill in a heap …when up the hill came our heros in form of th Boy Scouts ( do you know of the Boy Scouts ? , not quite so popular these days unfortunately) sorted our tent and left just like that , like magic actually . Boy Scouts to the rescue – wow, just like magic. Yes, we do have them in the States. Their motto: Be Prepared! And they always are ready to do their duty, bless their hearts. We are very indebted to the Bossler people. They don’t expect payment at all, and we feel so, so grateful. Thank you for telling about the camping episode, Cherry – funny and touch, both! What a lovely labour of love! Thank you, Fiona. Love is a great motivator. These are the actions we all need to read about. To experience. To thank those who help others out of love and the belief that we’re all here together – in this world – to ‘be there’ and to help each other. This gave me goose bumps, Marian. If muscle-y hard work inspired goose bumps, I’ll take that as a compliment, Pam. Thank you! Ahhh, Marian. A man’s muscles can lead to many goose bumps. 🙂 But kidding aside, I like how women aren’t ashamed now to build some arm muscle too, and then use their strength to help their neighbors. Actually there are 3 damsels in distress, but with these people it doesn’t make a difference: They see need and respond. I wish the rest of the world 🌎 would “spin” this way. Your follow up comment makes this feel like a real conversation Debbie.